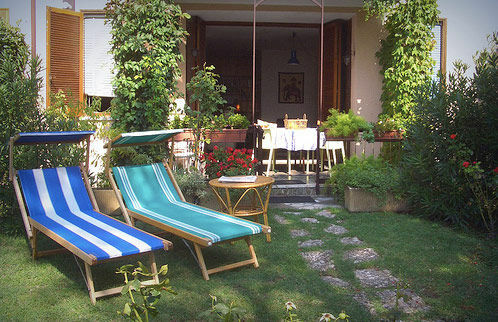 Right on the lake, in residence with private garden rentable (min x 15 days) from March to October. Pleasant and delicious apartment with view and access on lake formed by living room with two double beds (very comfortable), 1 double room, 1 study / single room, 1 bathroom with bathtub and shower, kitchen, terrace surrounded by garden (flower pots with herbs!) with access to the garden, (with view on the lake) private beach and pier exclusive use for residents (direct access from the garden). 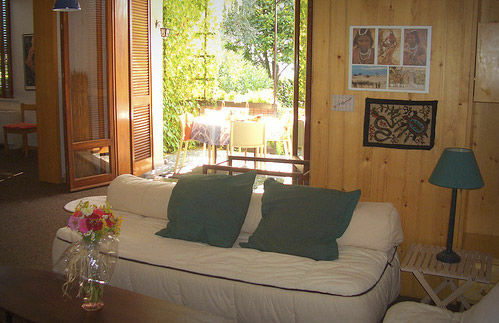 Apartment with garden on the lake along the lakeside promenade connecting Garda in Bardolino until Lazise. 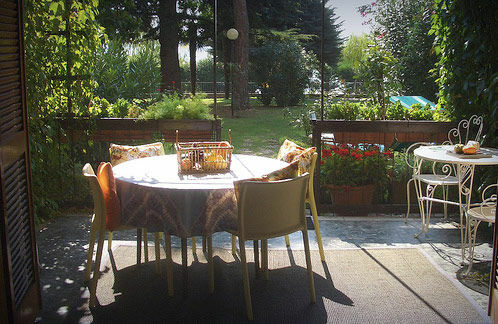 Behind the residence there is the park of the Rock Garda which offers scenic walking by foot and by bicycle. Location secluded and quiet. Ideal for living in perfect peace. 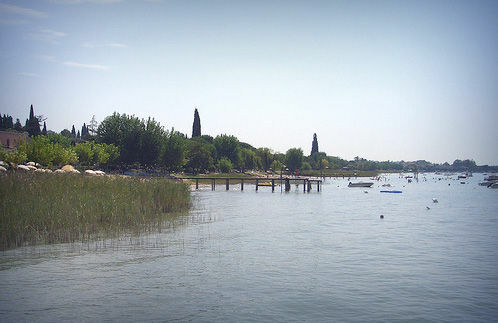 A4 MI-VE: Peschiera exit, then take the SS Gardesana, Garda direction. A22 BRENNERO: Affi exit, then follow signs to Lake Garda (Bardolino), then take the SS Gardesana, Garda direction. Quite consistent with what was advertised, beautiful views of the sea, beach and shops nearby, good exposure of the apartment. Tout à fait conforme à ce qui était annoncé, belle vue sur la mer, plage et commerces à proximité, bonne exposition de l'appartement. A beautiful setting, ideal for a family with children. Near beaches, pedestrian and cyclist at the water's edge. Apartment very comfortable and well appointed. Nothing but happiness strongly advise. Un cadre magnifique, idéal pour une famille avec enfants. Proximité des plages, rue piétonne et cycliste au bord de l'eau. Appartement très confortable et très bien agencé. Rien que du bonheur à conseiller vivement. The object is not just a new building, but both the premises, as well as the whole plant are well maintained. The atmosphere of the residents with each other was pleasant and the location of the object is perfect. Would you like to book again for next year. Bei dem Objekt handelt es sich zwar nicht gerade um einen Neubau, aber sowohl die Räumlichkeiten, als auch die ganze Anlage sind sehr gepflegt. Die Atmosphäre der Anwohner untereinander war angenehm und die Lage des Objektes ist perfekt. Würden gerne wieder für nächstes Jahr buchen. This rental has had one or several Service Quality enquiries following the renters' reviews. This rental has an excellent Service Quality rating. The Service Quality process is designed to maximise listing reliability and guest satisfaction. The Service Quality rating is based on guest satisfaction, the listing's history, the outcomes of any quality enquiries, and management of the rental in question. All these factors give us an objective overview of the listing's reliability and the quality of the property. Apart from the most recent listings, it’s quite normal that the majority of listings get a good or excellent rating. In effect, listings that are not objective or are unreliable are quickly identified and subjected to\ a quality enquiry. If the complaints made about the rental are confirmed, the problem will either be corrected (listing altered or rental improved) or the listing will be removed from the site. If you would like the Service Quality team to check out this listing, click-here. The owner has not indicated a booking. You can contact the owner to check the rental availability. You can also inform us if the calendar for this listing has not been updated. Why are MediaVacationRentals.com vacation rentals cheaper? The price does not include the cost of heating (not the summer months) and light and the final cleaning (€ 50). Sheets and towels upon request. Due to our strict listing-management policies, MediaVacationRentals.com© is able to offer renters an optional multi-risk insurance package covering: non-compliance of rental properties with listings, damage caused by tenants, vacation cancellations or interruptions, fraudulent rentals, travel assistance. Click here to find out more. You have no favorites at present.